Call today for your Alamo Car Service to SFO at 1.800.380.9788. Why put extra miles on your car? There are so many hassles with driving yourself to SFO. Just relax and let our Alamo car service take you to SFO in style. With Bay Area Car Service’s Alamo car service to SFO, we are the answer to all your driving headaches . Bay Area Car Service will chauffeur you to/from SFO and Alamo in one of our luxury cars. You can relax and use the extra time to pack, relax or just sleep in. Our prices are competitive and affordable! You will need to book your reservation 24 hours in advance. Our chauffeurs will pick you up or drop you off 24 hours a day, seven days a week. Flying in to SFO? If you book a reservation with Bay Area Car Service’s Alamo Car Service, one of our chauffeurs will meet you after you pick up your luggage and whisk you off to Alamo. Just sit back and enjoy the ride as our trained, experienced chauffeurs ensure you safely arrive at your destination. A reservation with Bay Area Car Service’s Alamo to SFO service means you won’t need to worry about arriving at the airport on time to get through security only to hear your name over the loudspeaker as final boarding is called. You can leave your car safe in your own garage, not in the long term parking lot. You’ll offset the cost of our services by not paying the airport parking fees. Getting you safe and sound to the SFO airport on time is our number one priority. Why wait for a taxi? They can be expensive and you’re not guaranteed a ride. Our chauffeurs will pick you up where and when it is convenient for you, any time of the day, dropping you off directly at the terminal, hotel, convention center or your front door. Our Alamo Car Service to SFO is a private, direct ride to the airport. Don’t wait for other customers with a shuttle service. More stops means more chances of being late. Our Alamo to SFO Car Service Guarantee. Our Alamo Car Service chauffeurs will get you to your home, hotel or office safely and quickly. That’s our guarantee. We know that flying – or even just getting to the airport – can be nerve-wracking, especially when dealing with picking up and dropped off strangers. Let us take over the driving while you take a break. Our courteous chauffeurs will meet you at the terminal and pack your bags. Before you know it, you’ll be at your destination. Our chauffeurs know where to pick you up, while your seatmate from the flight in is still trying to remember where he left his car in the long-term parking. Using Bay Area Car Service, you’ll be confident in the knowledge that one of our chauffeurs is waiting for you with a smile when you land, ready get you to your home, office, conference, convention or vacation retreat with no hassle. Ready to book a car? 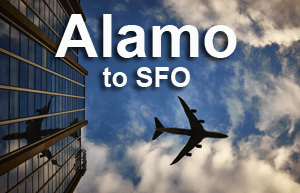 Call 1.800.380.9788 or click here to reserve your Alamo Car Service to SFO!